Regulatory T (Treg) cells belong to the CD4+ T cell subset. Their unique function, the suppression of immune responses, has made them an interesting target cell population for immunotherapy in a number of different indications in mice and human, including treatment and prevention of graft-versus-host disease (GvHD) after haploid stem cell transplantation (HSCT)1-4, suppression of solid organ rejection after transplantation5-9, and treatment of autoimmune diseases like type 1 diabetes10. To address the variety of Treg cell applications arising from different target indications, Miltenyi Biotec provides a broad range of tools and reagents facilitating the isolation and expansion of various Treg cell populations. 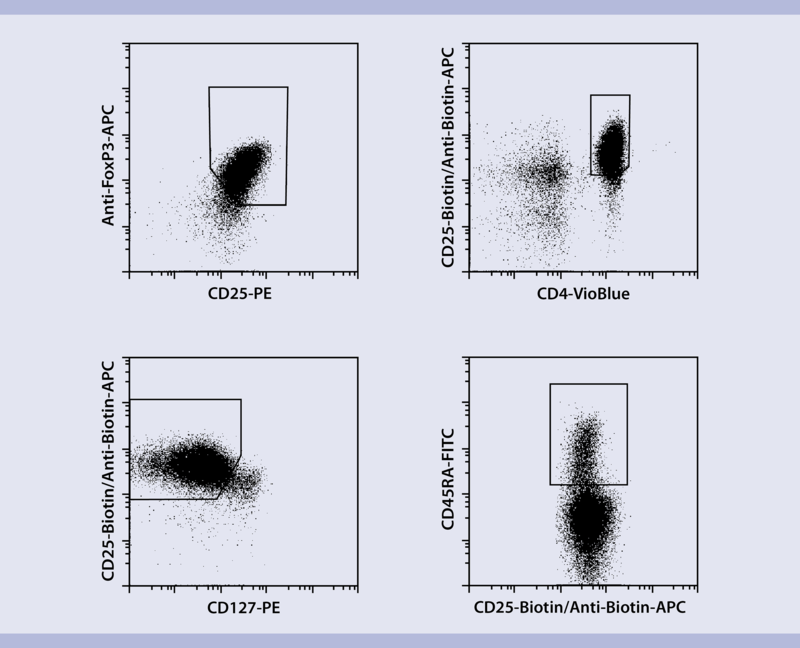 Treg cells for clinical applications can be either enriched or depleted using the CliniMACS Cell Separation System in combination with the CliniMACS CD25 Reagent. Cells expressing high levels of CD25 can be enriched with or without prior depletion of CD8+ or CD19+ cells. Clinical-scale CD25+ cell separation from leukapheresis products using the enrichment protocol for cells expressing high levels of CD25. After cell separation, one representative cell sample was stained for CD4, CD25, FoxP3, CD127, and CD45RA. 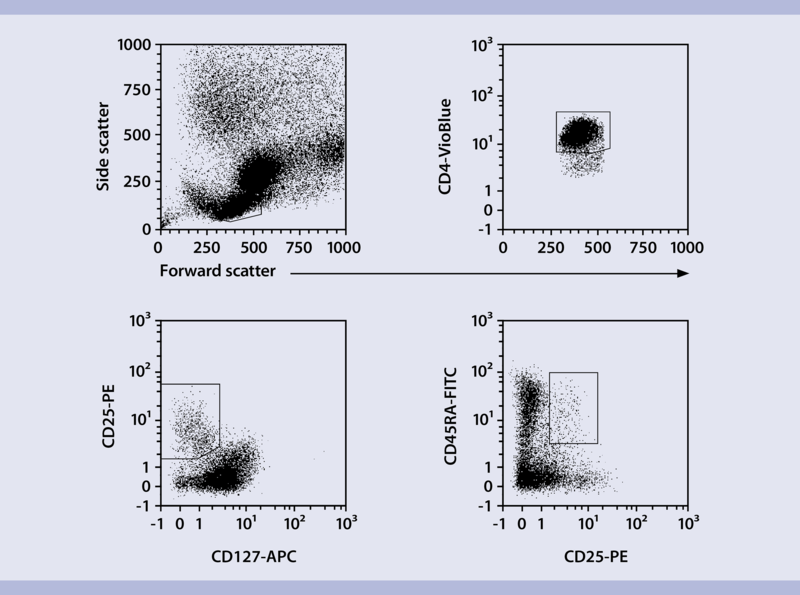 Dot plots displaying FoxP3, CD127, and CD45RA marker expression were gated on CD4+ T cells. MACS GMP Fluorescent Antibodies have been developed for flow cytometric detection and subsequent flow sorting of highly pure Treg cell populations in clinical settings. 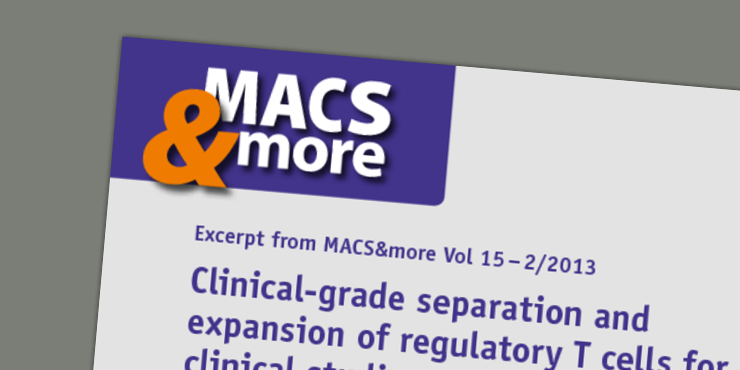 MACS GMP CD25-PE-Biotin and CliniMACS Anti-Biotin Reagent can be used for magnetic pre-enrichment of Treg cells from large volumes, followed by flow cytometric sorting for a defined and pure final product. Martelli, M. F. et al. (2015) Next generation HLA-haploidentical HSCT. Bone Marrow Transplant. 50: 63–66. Theil, A. et al. (2015) Adoptive transfer of allogeneic regulatory T cells into patients with chronic graft‑versus‑host disease. Cytotherapy 17(4): 473–486. Hannon, M. et al. (2014) Infusion of clinical‑grade enriched regulatory T cells delays experimental xenogeneic graft‑versus‑host disease. Transfusion 54(2): 353–363. Nadig, S.N. et al. (2010) In vivo prevention of transplant arteriosclerosis by ex vivo-expanded human regulatory T cells. Nat. Med. 16: 809. Sagoo, P. et al. (2011) Human regulatory T cells with alloantigen specificity are more potent inhibitors of alloimmune skin graft damage than polyclonal regulatory T cells. Sci. Transl. Med. 3: 83ra42. Issa, F. et al. (2010) Ex vivo expanded human regulatory T cells prevent the rejection of skin allografts in a humanized mouse model. Transplantation 90: 1321. Wu, D.C. et al. (2013) Ex vivo expanded human regulatory T cells can prolong survival of a human islet allograft in a humanized mouse model. Transplantation 96: 707. Safina, N. et al. (2016) Successful expansion of functional and stable regulatory T cells for immunotherapy in liver transplantation. Oncotarget 7(7): 7563–7577. Bluestone J.A. (2015) Type 1 diabetes immunotherapy using polyclonal regulatory T cells. Sci. Transl. Med. 7, 315ra189. Putnam A. L. et al. (2013) Clinical grade manufacturing of human alloantigen-reactive regulatory T cells for use in transplantation. A. J. Transplant. 13: 3010–3020. Battaglia, M. et al. (2005) Rapamycin selectively expands CD4+CD25+FoxP3+ regulatory T cells. Blood 105: 4743–4748.